Property 5: Enjoy this little cottage in the woods built by Grandy and Grandma! Property 6: Your own private island! Rustic and close to Nature. Property 10: Westport Island Cabin on the river with private dock. Drive, boat or fly in. Property 11: Private waterfront home w/ large deck and deep water dock! Property 18: Bayfront cabin w/ incredible views & shared dock - ideal for hunting/fishing! Property 33: Welcome to "Captain's Catch"! 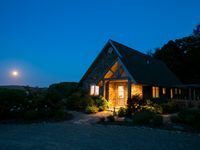 Quaint, quiet and affordable cottage awaits! 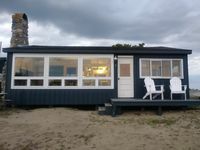 Property 39: 3 bedroom cottage only 187 steps away from Popham Beach! Property 50: Driftwood Cottage - Renovated Oceanfront with Stunning Views in East Boothbay! This was the perfect spot for a much-needed summer getaway for us (family of 4 + our 2 four-leggeds). Absolutely stunning, all around. The grounds and the cottage are pristine with a warm vibe. A truly magical place. (And, the house did remain cool even on the warmer days in August.) The airstream proved to be a welcomed extension of the space as well, especially for our teenage daughter(!). John was a great host and Ed, the property manager, was a pleasure as well and a great help when we needed it! Highly recommend. Thank you, John &amp; family, for a memorable retreat. Hope to be back again, someday.